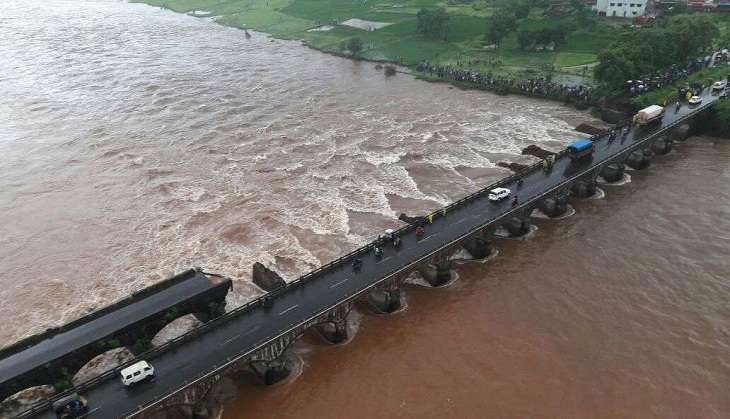 Even as rescue personnel failed to trace more bodies in Savitri river after the collapse of a bridge near Mahad in Raigad district, they have decided to intensify the search today as water flow has receded. So far, 26 bodies have been recovered during the search and rescue operations launched a day after two State Transport buses and some other vehicles fell into the swollen river after the bridge collapsed on the night of August 2. Despite all efforts by NDRF, Navy, and Coast Guard, no body or remains of vehicles could be traced yesterday. "The flow of flood water has receded a bit since this morning and therefore, we have intensified our search operation near the collapsed bridge now," NDRF's 5th battalion commandant Anupam Srivastava told PTI today. "Almost 150 meters area of the collapsed bridge has not been searched so far extensively due to rapid current of river water and now we are focusing on this too," he said. When asked how long their search would continue, Srivastava said his team would not call off their operation till they get orders from higher authorities. "We would try to reach as near as possible to the site of collapsed bridge this afternoon to be doubly sure that there are no vehicles stuck near the bridge," he said. The NDRF team would also focus on tracing the remains of vehicles in left over areas of Kemburli, he said. The team is tracking the area through GPS and has also briefed the anxious kin of victims about their efforts. "Few anxious kin of victims, whose bodies have not been found so far, wanted to know about our efforts. We explained to them about our efforts as well as the techniques we are using," Srivastava said. On Sunday, two bodies were recovered during the search and rescue operations launched since 3 August. Raigad's Residential Deputy Collector Satish Bagal had yesterday said there are chances that the unrecovered bodies might have got stuck in the washed away vehicles, which are also yet to be traced. The National Disaster Response Force (NDRF), Navy and Coast Guard officials have so far been able to locate only a signboard of one of the missing State Transport buses bearing the word 'reserved' on it. Srivastava said they are using various advance techniques, including electronic sensors, fish finders (sonar devices), and massive magnets to trace the metal bodies of the vehicles in the water.